John Maus - Songs. Vinyl LP. Bleep. 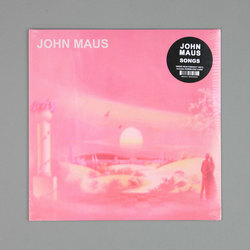 Here we find Ribbon Music (Omar Souleyman, Black Dice) reissuing the debut LP from pop’s premier existentialist John Maus. Originally put out in 2006, the forthrightly-entitled Songs plunges us head-first into a singular aesthetic. Of course, history remembers Maus standing alongside his pal Ariel Pink as one of the progenitors of hypnagogic pop, and the likes of ‘I’m Only Human’ and ‘It Takes Time’ are still striking, pink-elephantine trips. However, the sixteen short entries of Songs also include hyper-lo-fi home-taping vignettes (‘That Night’) and evocative, droning incantations (‘Forever and Ever and Ever’). With this re-release coming off the back of recent Maus full-length Addendum, this is a fine time to reacquaint yourself with one of the more original musical stylists of the 21st Century.